Figure 3 of Okuda, Mol Vis 2010; 16:2438-2445. Figure 3. ELOVL4ΔC interacts with other ELOVLs. HEK 293T cells were transfected with a pCE-puro HA-1 (vector; A and B), pCE-puro HA-ELOVL4 (A), pCE-puro HA-ELOVL4ΔC (A), or pCE-puro HA-ELOVLx plasmid (where x represents each ELOVL number; B), and with the pCE-puro His6-Myc-1 (vector; A), pCE-puro His6-Myc-ELOVL4 (A and B), or pCE-puro His6-Myc-ELOVL4ΔC plasmid (A and B). Total cell lysates were prepared from the transfected cells and solubilized with 1% Triton X-100. 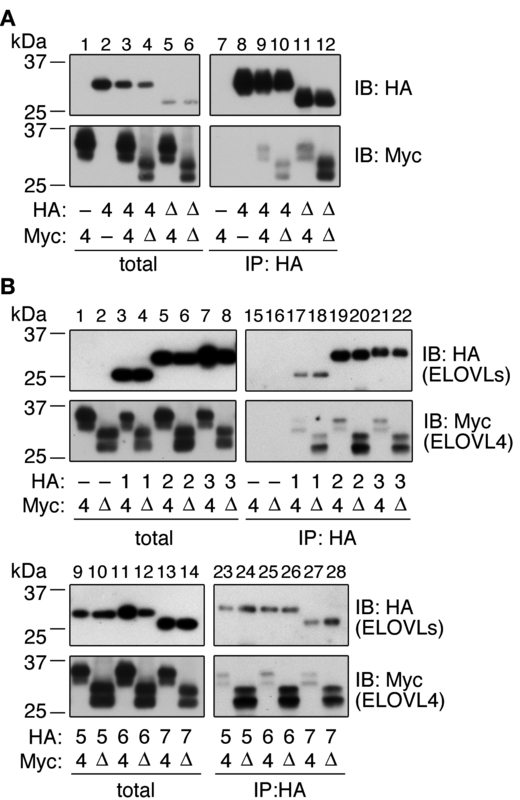 Following immunoprecipitation with the anti-HA antibody, total lysates (1×) and bound proteins (A, 8×; B, IB: HA, 1×; B, IB: Myc, 16.5×) were subjected to immunoblotting with anti-HA or anti-Myc antibodies. IP, immunoprecipitation; IB, immunoblotting; -, vector; 4, wild-type ELOVL4; Δ, ELOVL4ΔC; 1, ELOVL1; 2, ELOVL2; 3, ELOVL3; 5, ELOVL5; 6, ELOVL6; 7, ELOVL7.